This was shot in our living room. He's facing an east facing window and he popped up over the couch to look at me. I just love his eyes, they sparkle just like that and every day they mesmerize me. This was shot mid morning with an east facing window. I used natural light from the window directly behind me. 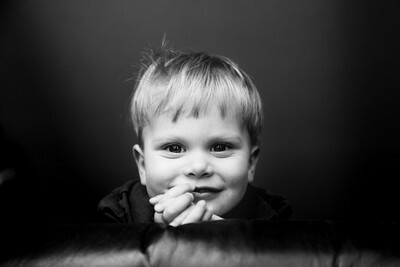 The couch is quite a few feet away from the window so that placed lighting on my son and the light dropped off him quite quickly, which is why the background is dark and shadowy. I remember this day last year vividly. To be quite honest, I was having one of those days where I felt uninspired but I forced myself to pick up my camera and shoot. Shoot anything. And this is what came of it. I didn't do much to this image. I converted it into black and white because this image was begging to be black and white. I upped the contrast a bit and pulled the blacks up. I liked the raw feel to this image and didn't touch his skin at all. The biggest advice I can give is watch the light. Even when your camera is not in your hand you can see how light falls on your subject. Is it flattering? Can it be made better? What would you change if you were to take a photo right now? Play around and find out what works best for your art.